While on the road, I encountered some unusually nice and trusting people. In Yangzhou, I came upon a restaurant with a long line of waiting customers. Experience tells me that local people gather for good food, and I readily fell in line. The restaurant served mainly hot pots and their tables were designed for four or more diners. I waited patiently for 15 minutes since they were reluctant let a single customer take up a large table. After awhile, the lady manager took pity on me and led me upstairs. Unlocking the manager’s office, she ushered me in and seated me at the office desk for my dinner. I ordered a cold pot sliced fish and a vegetable dish. The thinly sliced fish dish was one of the best I ever ate, justifying the high reputation Yangzhou cuisine enjoys in China. I enjoyed it so much I intend to bring Sally to view plum blossoms in Nanjing and dine in Yangzhou next Spring. I marveled at their complete trust in this total stranger. Maybe my earnest face won her confidence. I ate alone in the office for half an hour with the manager’s handbag within my easy reach. I hope my proper behavior reinforced their faith in the goodness of humanity. While strolling on a boulevard in Wuxi one afternoon, I saw a boy of about 12 acting suspiciously. He followed in a crouching posture a young couple in front of me and reached for the woman’s handbag clutched under her arm. He tried 3 times without success in opening the zipper. I was only 10 feet behind this crime in process, and I gave out a hearty loud shout. The boy was startled, withdrew his hand, and turned to look at me. I was surprised to see the boy to be white skinned and fair haired, perhaps a Kazark. One of his eyes was blind, impeding his spatial judgement and thus his ability to pick the woman’s handbag. Then I noticed 5 Uiger men standing around, grinning at my audacity in interfering their business. I walked briskly away. Petty crimes happen in China. Some Uiger people leave XinJiang for coastal cities to make a living, and sometimes join criminal gangs. China has a policy of maintaining harmony among its many minorities and the Han majority, and allows the Uigers carry daggers even in cities as their custom. Another kind of feared crime is highway robbery. Sometimes several criminals would ride a bus and rob its passengers en route. Some bus companies videotape all passengers before the buses leave terminals. 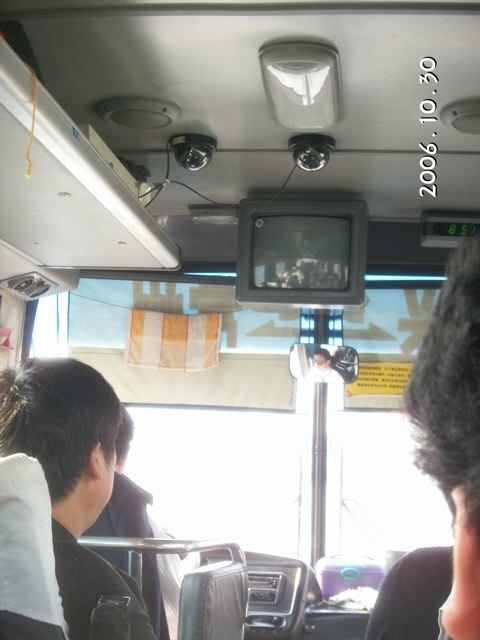 This bus has video cameras and recorder to monitor passengers. It’s Big Brother in action, but I felt safer. I guess this is the US Patriot Act in action. In 7 days, I found one out of four taxi drivers I came into contact would try to fleece me. One tried to get me to agree to 28 yuan for a 8 yuan trip, and another took me for a long ride. One got caught when I told him my compass showed he was traveling the wrong direction for 15 minutes, and he accepted my lower payment. The way to avoid being victimized is to look and act knowledgeable about the local geography and the destination. 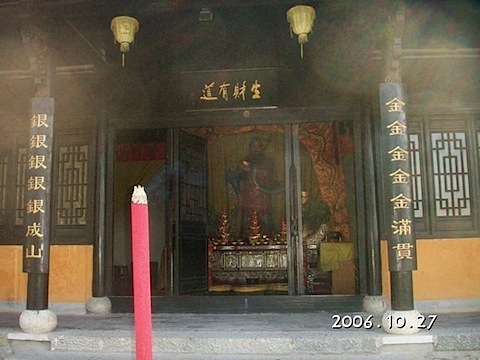 One temple in Nanjing has people pray to the deified GuanGong for an unusual purpose. GuanGong is normally worshipped for his righteousness and loyalty while alive, but this temple should make him turn in his grave. The alter was piled high with simulated gold ingots instead of the usual offering of fruits, and the gold-painted tablets unabashedly stated their wish. The tablet on top stated “the way to grow rich”. The couplets stated “Gold, gold, gold, gold, gold all lined up” and “Silver, silver, silver, silver, silver piled into a mountain”. Money-worshipping seems to be the new religion in China. It has replaced Communism as the ethos of many Chinese people. 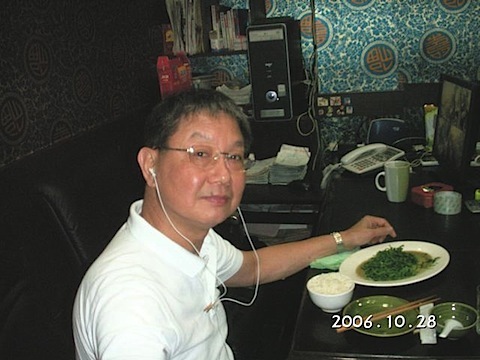 Posted by Robert Wu on Tuesday, November 14, 2006, at 7:25 pm. Filed under Uncategorized. Follow any responses to this post with its comments RSS feed. You can post a comment or trackback from your blog.